1. Bosque del Apache, or “Woods of the Apache,” may have been the home of humans for more than 700 years, but this 57,331-acre refuge sprawled across the Rio Grande Valley in Socorro County, New Mexico, has served as a timeless gathering place for tens of thousands of sandhill cranes, geese and ducks every fall and winter. Because of its unique character and isolation, Bosque del Apache is a must-visit for every digital photographer with a passion to capture the beauty of one of the most important bird and wildlife refuges in the world. 2. During the autumn the first migrating birds arrive and reach their peak during January. The most spectacular visitors are as many as 14,000 sandhill cranes that remain in the Refuge until late February before traveling north to their breeding grounds. Another 32,000+ snow geese and Ross geese also winter here as well as great blue herons, some pelicans, avocets, buffleheads, redheads, northern shovelers and ring-necked ducks. With such a huge bird population in the area, their predators also appear: golden and bald eagles, northern harriers and a variety of hawks. Many birders and digital photographers have discovered they can position themselves quite close to the flocks, capturing detailed images of single birds or the ritual dance of sandhill cranes, which mate for life. 3. The US Fish & Wildlife Service manages Bosque del Apache, which also presents the landscape photographer with an interesting diversity of biospheres. Most of the Refuge is the moist bottomlands and active floodplain of the Rio Grande. Large expanses of wetlands and riparian forests and nearby farms also receive water from the area. The remainder of the Refuge consists of foothills and mesas, which the Chupadera Mountains frame to the west and the San Pascual Mountains to the east. The majority of this desert environment is preserved as wilderness areas. The desert lands present an arid kind of beauty that is in sharp contrast to the watery habitats of the valley. The palette of subtly colored rocks have been carved by wind and sand for countless years, creating incredible formations and desertscapes for your digital photography. 4. The wildlife of Bosque del Apache has grown so accustomed to humans that an automobile becomes an excellent photography blind. The 15-mile auto tour loop road provides access to viewing decks, boardwalks and bird blinds from which to take many excellent wildlife images. The Refuge also includes a number of hiking and biking trails. 5. Many mammal species make their home in Bosque del Apache throughout the year, including deer, coyotes, turkey, pheasant and occasional elk. 6. 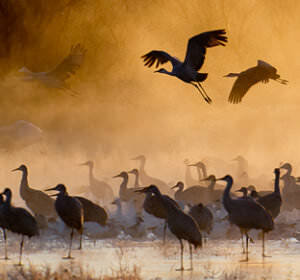 A trip to Bosque del Apache is not only an adventure, but also a rare opportunity to learn advanced landscape and wildlife photography techniques during the Visionary Wild Bosque del Apache Workshop, January 7–11, 2013. You are promised an unprecedented photographic learning experience, as Jack Dykinga, acclaimed landscape photographer, and Justin Black, Visionary Wild co-founder and assistant instructor, will help you develop your creativity and visual acuity to capture compositions you might otherwise miss. The American Southwest is Jack Dykinga’s home away from home and an environment he has explored and photographed for three decades. Jack and Justin have purposely scheduled working sessions during dawn and dusk hours when birdlife and other wildlife are most active. In addition, the light of this region has special qualities that are important creative tools. Jack and Justin will show each participant how to see and work with that light in personalized and group instruction. Regular classroom sessions are scheduled throughout the Workshop, with Jack and Justin explaining the essential techniques of composition and light and using exposure creatively as well as providing confidence-building critique. Visit the Visionary Wild Web site for complete information about the organization and its many Workshops. Details on the Bosque del Apache Workshop can be found at http://visionarywild.com/workshops/bosque-del-apache/.